Pittsburgh Panthers running back James Conner runs into the end zone during the first quarter of the Little Caesars Pizza Bowl vs. the Bowling Green Falcons. Sometimes, it’s all about what you make of it. Sure, the Little Caesars Pizza Bowl might not be the Rose Bowl, or even the Pinstripe for that matter. You could see it as a matchup between two unranked teams in Bowling Green and Pittsburgh, or you could say the Falcons deserved a look after they took down an undefeated Northern Illinois and derailed the Huskies’ BCS bid. And how about that Matt Johnson kid? He outplayed Heisman finalist and NIU QB Jordan Lynch by throwing five TDs and no interceptions in the MAC title game, after all. Maybe you turned the channel instead of finding a unique storyline to keep you engaged. If you did, you missed Pitt RB James Connor earning game MVP honors and a school record by breaking Tony Dorsett’s mark for most rushing yards in a bowl game with 229 and a TD. Here are the other highlights of the Panthers beating the Falcons 30-27. "Pizza, Pizza!" The teams battled to a 17-10 Pitt halftime lead following Tyler Boyd’s 54-yard punt return TD in what was arguably the highlight of the half. He split a pair of initial defenders before tiptoeing the sideline on his way to the end zone. Meanwhile, Bowling Green QB Johnson threw for 101 yards and a touchdown, while Connor kept the game close with ten carries for 64 yards and a score of his own. Overall, it was a pretty normal game — say, like a plain cheese pie. Bowling Green’s BooBoo Gates changed that when he returned the opening kickoff of the second half, carrying the ball for 94 yards and a touchdown. The nation now knows of the greatness that is Booboo Gates. Meanwhile, this scuffle was happening in the backfield. 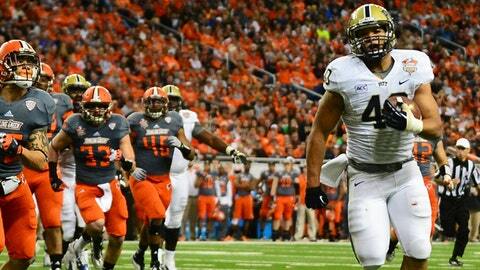 Bowling Green LB D.J. Lynch might be getting a call from UFC’s Dana White after these haymakers. Amazingly he only got a 15-yard penalty and was not ejected. For Pitt, the freshman RB Connor carried a majority of the rushing load, amassing 229 yards and a touchdown using a combination of shifty moves and brute force. Conner even played a handful of snaps on the defensive line. Under center, Pitt redshirt freshman Chad Voytik stepped up in place of an injured Tom Savage to start the second half, throwing for 108 yards and converting a 5-yard run that put the Panthers on top 27-20. Even though Bowling Green’s Johnson would tie the game on the next drive with a throw to the end zone, Voytik and Connor responded quickly by marching Pitt back down the field to set up a game-winning, 39-yard field goal by Chris Blewitt. 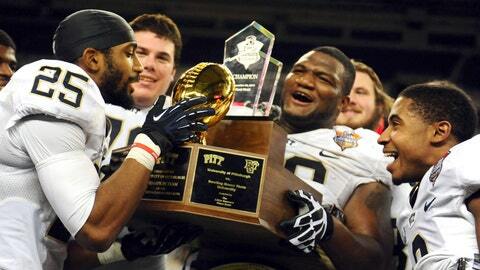 Those three points were enough to earn Pitt a shiny piece of hardware. Panthers players celebrating with the Little Ceasars Pizza Bowl trophy.